Location: /Sheet music/Guitar Series/SERENADE. BY FRANZ SCHUBERT. Schubert was an able guitarist and wrote many of his songs with a guitar accompaniment, only adding a piano part later. 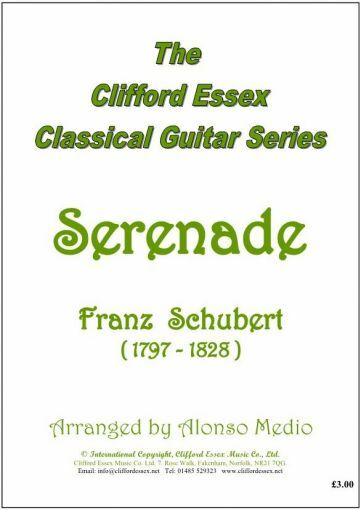 The Serenade has a beautiful flowing melody typical of this composer, with an accompaniment which fits naturally on the guitar. 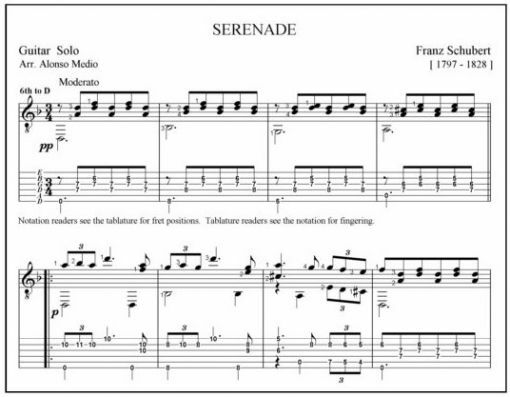 Combining the song and the accompaniment makes the piece a little complicated to play, but this arrangement manages to convey the lyrical aspect of the melody, with the quiet supporting accompaniment, and a guitarist of average ability should have no difficulty with it. It will help beginners to find their way around the fingerboard, and all classical guitarists should derive a great deal of satisfaction from playing it.